The What: Alteros, an Audio-Technica company, has introduced a direct-to-fiber extension to its GTX 6.5 GHz Ultra Wide Band digital wireless microphone system, providing enhanced range and flexibility. 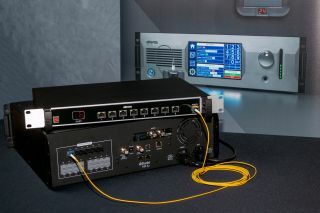 The What Else: The standard GTX system allows up to 32 GTX32 transceivers to each be connected to a 3U GTX3224 control unit with up to 1000 feet of Cat 5 cable, creating a L.A.W.N. (local area wireless microphone network) system to communicate bidirectionally with up to 24 GTX24 wireless microphone transmitters—24 microphone channels and 24 talkback channels with an additional eight group channels. With the introduction of the GTX3224F control unit version, 16 rear-panel Cat 5 transceiver ports are replaced with six fiber ports. Fiber connections measured in miles instead of feet can connect the control unit to up to six GTX-FX8 8-port fiber breakout nodes for remote Cat 5 connection to the network and power for to up to 48 GTX32 transceivers (up to 16 GTX32s can be connected directly to the GTX3224F by Cat 5 for a total capability of 64). The result is a system that can cover extremely large venues, and multiple locations within a venue, as was proven with ESPN’s successful deployment of the Alteros Direct-to-Fiber GTX system for coverage of the 2018 US Open Tennis Championships. The Bottom Line: The GTX3224F and GTX-8 hardware will be available November 2018.